Chili’s is known for their high quality fajitas. These are easy to prepare, and you can have that special Tex Mex flavor any night of the week. 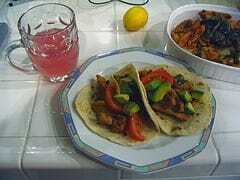 Thanks to Arrington for sharing this fajita recipe. You can make Chilis Beef Fajitas by cooking the fajitas in the slow cooker. Cut sirloin steak into thin strips. Place in Crock-Pot, with chili’s, soup mix & water. Cook on low, 6-8 hours. Chop onion & bell pepper in small stripes, sauté in olive oil. Warm tortillas in microwave. Drain beef mixture. Place in center of tortillas, top with cheese, salsa, onions, peppers. I believe they serve Monterey Jack and a Cheddar blend. Also, as I was browsing through your recipes, I found a recipe for la mansions chicken fajitas. In response to my last comment, this is more of the flavor I was looking forward! These are fantastic and so easy to make. My family and friends loved them I made them when we went camping and they were a big hit. Thank you for the recipe.